On Tuesday December 12th, Metrotown residents and anti-demoviction activists trekked back to Burnaby City Hall to face down the Corrigan Council at a hearing for a rezoning application that, when passed, will replace 3 more low-end of market Metrotown apartment buildings with a massive condo tower. At 520 feet, this new building will clock in at the highest tower in Burnaby’s “new downtown” Metrotown. But rather than the height and density bonus that the Corrigan Council is gifting to Thind Properties, their biggest financial donor to their Party from the 2014 civic election, media coverage of this rezoning has focused on the non-market rental units coming with the condos. In the lead-up to the rezoning hearing, Corrigan and a corporate journalist boosted the Thind rezoning’s non-market component as a solution to the housing crisis and claimed the project was uniting demoviction critics, residents facing displacement, and developers. The protest at the rezoning hearing exposed all these claims as nothing more than development industry spin; the Thind rezoning uses “non-market” as a new developer weaselword, like “affordability”. Stop Demovictons Burnaby has attended, rallied and spoken at countless rezoning application Public Hearings before this one; but this time around, access and anti-dissent security were different. We saw dramatically heightened security, surveillance and police presence at a council hearing that is, legally open to all members of the public. Before even entering city hall, protesters were faced with a security set-up outside the building. Security guards stood with a table, a large sign with “rules” regarding behaviour at city hall, and a bag check. A city staffer joined the security guards to oversee the process, as anyone who wanted to attend the public hearing was forced to hand over their bag to ensure that there was nothing “dangerous” brought into the council chambers. The security presence at City Hall was intimidating to tenants who are not used to this type of surveillance. Some residents of the buildings being rezoned came to City Hall for the first time. The new barriers to access (and dissent) at City Hall ask — whose views are really welcomed by Corrigan’s council? What message does this send to vulnerable tenants facing eviction? Most residents say they won’t go to a rezoning hearing because they feel the Council will not hear them; and this sense of inevitability is frightening. Astrid Casteneda, a Metrotown resident who is active with the Stop Demovictions campaign, explained this feeling to Burnaby Council; she said, “We are scared. Every new rezoning scares the community.” By increasing security measures against public access, Council is doubling down on this division between the tenants facing displacement and the development public hearing process. The message given by security guard bag searches and police on guard is that City Council feels tenants are a danger, an impediment to the real estate development process, not a constituency they must respect, hear, and protect from displacement by demoviction. Despite the high-level of security and attempts to crack down on dissent, there was a strong showing of opposition to Thind’s rezoning application. The amount of speakers at the public hearing who spoke against the development outnumbered those who spoke in favour by roughly ten to one. These speakers felt that the proposed non-market units were not enough to make up for the loss of low end of market, purpose built rental units this development seeks to destroy. Speakers took on the “non-market” weaselword that Corrigan and Co. have thrown up as a smokescreen around the Thind rezoning. The problem, they explained, is that the new non-market units will end up being more expensive than the existing low end of market apartments where current residents live. Although all of the funding for the non-market units is coming from the City and Province, there is so far no public money dedicated to guaranteed rent subsidies. New Vista, the non-market housing provider, hopes they will be able to subsidize some non-market units by charging more for other non-market units. This strategy shifts the burden for non-market housing provision away from the Provincial or Federal social redistribution of wealth through government taxation to the redistribution of income at the level of the building. Rather than the government taking taxes from the rich and redistributing that money in the form of housing to the poor, New Vista will take extra rent money from the slightly less poor, as a subsidizing rent, and redistribute it to the slightly more poor as subsidized rent. For a 1 bedroom apartment, the subsidizing rent rate will be around $1,400 for a 1bedroom and the subsidized rent rate will be around $900 – which, because the building will operate under BC Housing rules, means residents will have to have incomes of $2,700/mth to qualify for even the subsided units. New Vista is using this “internal subsidy” model of non-market housing because the Provincial NDP government is continuing BC Liberal austerity policies, forcing 3rd party housing providers to develop alternatives to tax-based social services. This brand of non-market housing also depends on partnership with profit-driven developers, meaning that this meagre amount of expensive non-market housing comes with mass displacement by gentrification. The only people who spoke in support of the project were the CEO of New Vista Society and the President of a city-funded organization, the Kingsway Imperial Neighbourhood Association. The success of their promotion of this internal subsidy project as a “solution” to the demovictions crisis hinges on the branding of these organizations as altruistic. However, as this proposed project makes clear, partnering with Thind Properties and the City of Burnaby actually pits service organizations in direct opposition to the people they serve. Stop Demovictions Burnaby is calling for tenants to come together and say “We Won’t Go” to the impending eviction notices. Corrigan’s council has clearly chosen the side of developers, so we must choose the side of our neighbours and stand with them to offer support, solidarity and resist the bleak future that is not inevitable, no matter how many times city councillors try to shove it down our throats. The December 12th 2017 rezoning application for 3 apartment buildings on Sussex Ave in Metrotown, if approved, will tear down 62 units of low-end of market purpose-built rental housing, spread across three two storey walks ups: 6585 Sussex, 6525 Sussex and 6559 Sussex avenue. These units typically house at least two, if not up to five people – meaning this project will displace approximately 130 people from their community. The Sussex rezoning is the first in what will be a rapid onslaught of demovictions following the Corrigan Council’s unanimous July passage of the Metrotown Downtown Plan – a gentrification scheme that is focused on turning the entire neighbourhood into luxury condominiums, displacing over 6000 renters in the process. The Sussex rezoning is a useful starting point for this demoviction spree for Corrigan’s Council because it includes a feelgood smokescreen. In an interview with the Burnaby Now, Mayor Corrigan said, “This kind of idea that’s painted out there of the rapacious developer really isn’t the case when you see a developer working like Mr. Thind has, with both the New Vista Society, the provincial government and the City of Burnaby to ensure this project was there and available to be utilized as part of his overall development.” An op-ed in the Vancouver called this project “a Metrotown solution to our affordable housing crisis” and claimed (without sourcing a single resident) the project makes “100 long-time residents facing eviction, the developer, B.C. Housing and the City of Burnaby all happy.” But does the non-market housing at Sussex really indicate a shift in Burnaby or BC’s approach to housing? Is it evidence of developer magnanimity? Is it a solution to our housing crisis? What kind of non-market housing is this? 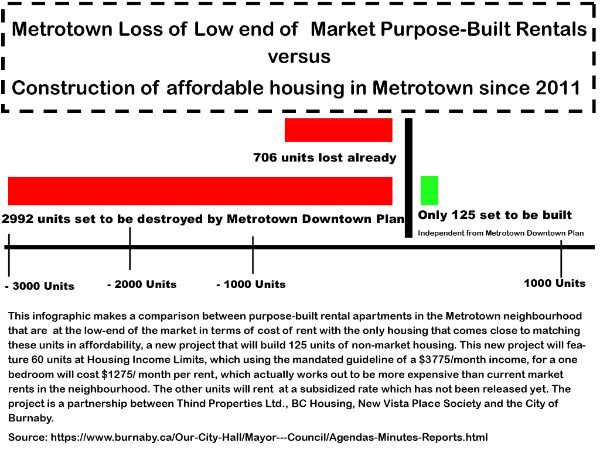 Although 327 market rental units and 125 non-market units are being proposed in this rezoning, overall there will still be a reduction in units at the low-end of or below market rates.The 125 non-market units – housed in a separate tower than the market condos – will include 60 units at BC’s “Housing Income Limits (HIL)” rates – which is $45,000/year for a 1 bedroom apartment. These units guarantee that you must not spend more than a third of your income on rent, which means that, because these units are not subsidized, to qualify for a one bedroom apartment, your income must be $3775/month, making your rent $1275/month. This form of non-market housing ends up being more expensive than current units are renting at in the buildings! The remaining 60 non-market units will be at some level of subsidy, but those subsidies will depend on money generated by the HIL-rate units, not from dedicated or secure funding from BC Housing. New Vista says they have not received an offer of operating money from BC Housing so they don’t know how much the subsidized units will rent for; they said they’re hopeful it will be something like $800-900/mth. An article in the Vancouver Sun makes the unsubstantiated claim that New Vista will house displaced residents in other projects in the interim and then in the non-market units. But New Vista says they were not contacted for this article, and that they typically have 4 to 8 empty units at any time; not nearly enough to house people displaced by this rezoning. Residents have not been approached about moving into non-market housing, most cannot afford HILs rent rates, and no one knows how much the subsidized units will rent for. It seems like the non-market housing is being used as a PR smokescreen by the developer and City, not as an actual housing option for affected people. The Sussex tower will also contribute to the cultural and economic gentrification of Metrotown. Metrotown is a community of low to moderate income people, some on fixed income, including new immigrants, indigenous people, young families, seniors and people with disabilities. Bringing in 300 wealthy new residents who can afford these new housing developments will drastically change the feel and profile of the neighbourhood, adding to the recent trend of renovictions in old apartment buildings. It is already evident in street level retail gentrification; new businesses geared towards a higher-income clientele are going up along Beresford street – these fancy french pastries are for the rich, not current residents. This new development will still contribute to the loss of our community, our neighbourhood – a place where people truly feel at home. Thind Properties Ltd was the largest donor to Derek Corrigan and the NDP-affiliated Burnaby Citizen Association in the 2014 Burnaby Civic Election; donating $21,125 to the party. Mayor Corrigan’s endorsement of Thind as evidence that developers are non-“rapacious” displacers seems bought and paid for, and also disingenuous. Although this project is described as a partnership between New Vista Housing Society, B.C. Housing and Thind Properties Ltd, Thind Properties is contributing no money towards the non-profit housing units. The City of Burnaby had the power to demand anything of Thind in exchange for the height and density bonus they will receive to develop a site zoned at 30 feet as a massive 520 foot tower. However, instead the City bought a parcel of land from Thind for $5.6Million and will lease the land to BC Housing, which will provide construction and operating costs. Thind is not producing the non-market housing on Sussex but Corrigan is giving them credit in order to disarm critics of the demoviction of Metrotown. Passing emergency legislation to declare purpose-built rental apartments everywhere in BC a protected housing stock and outlaw all renovictions and demovictions. Social housing now! Opening 10,000 units of emergency modular housing immediately to replace homeless shelters throughout BC and immediately beginning to build 10,000 units of a range of permanent non-market housing including social and co-op housing to end the crisis of evictions, unaffordability, and homelessness created by the profit-driven real estate industry.